[Leafcutter] is big in to making music and has put together all sorts of musical instruments and tools over the years. Recently, he was inspired to make his own piezo crystals, and wrote in to share the results of his experiments with us. 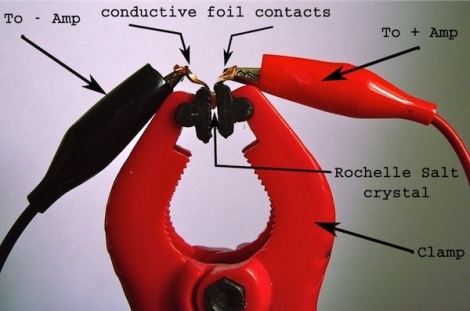 [Leafcutter] is no stranger to messing around with piezo elements, and after seeing [Collin’s] tutorial on making your own piezo crystals at home, he knew he had to give it a try. He stopped by the grocery store to fetch all of the ingredients, then followed [Collin’s] instructions to the letter…well, almost. It seems that he might have cooled the solution too quickly, so he found himself with a jar full of tiny, barely usable piezo crystals instead of larger ones like [Collin] was able to produce. Undeterred, he decided to see if the stuff was any good, and rigged up a makeshift contact microphone using some conductive foil and a clamp. He piped the output to his amplifier, and wouldn’t you know it…it worked! He has a small sound clip of what the mic sounded like on his site, and it worked pretty darn well despite the crystal’s tiny size. He is going to give the whole process another go, so we hope to see more experiments with bigger crystals in the near future. There’s been a lot of stories about arranging solar panels to mimic leaves on a tree, thereby boosting their efficiency. But before reading that story you might want to check out this blog post correcting some flaws in that breakthrough (page is down, here’s a cached version). Before we go any further, we’d like to point out that the original work was done by a seventh grader. He looked at leaves on trees and postulated that the Fibonacci sequence can be found in the layout of leaves, and that by laying out solar cells in the same way you can capture more sunlight. Comments can get negative fast around here, so remember that trashing his work may discourage other kids from participating in science fair events. Anyway, long story short: there were some issues with original assumptions, and about what was actually being measured during testing. The article linked at the top covers the fact that the cells were not measured under load, and that simple calculations can show why the tree-mimicking-cell-placement can be proven sub-optimal to 45 degree, south-facing solar farms. You know them, you love them, you take them for granted – they are single push button on/off switches. As [Dino] explains in the most recent episode of his Hack a Week series, they are typically implemented in the form of IC logic switches nowadays, but it wasn’t always that way. 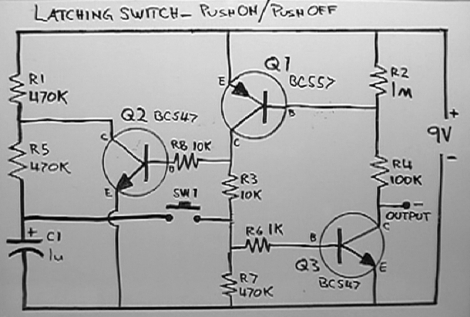 When they first came on to the scene in the 70’s, the single button soft switches were built using a set of transistors and a capacitor to get the job done, so [Dino] decided to research push on/push off transistor switches a bit and build his own. After reading through a short tutorial, he was ready to go. As he explains in the video, the operation of the switch is fairly simple, though he did run into some odd issues when he prototyped the switch on a piece of breadboard. He’s looking for someone to explain why the unstable circuit suddenly performs better with the addition of a small capacitor between the battery’s positive lead and the circuit’s output, so if you have some insight, be sure to speak up in the comments. In the meantime, check out [Dino’s] exploration of push on/push off switches below. Earlier today, [Jack] posted his latest video. He then promptly ran off to the secret Hackaday headquarters to begin work on the next one. Unfortunately there was a weird problem with Youtube which left the video un-viewable. We’ve fixed it now and wanted to let everyone know. We’ve also been getting lots of questions about the videos, mainly about what future content we’ll cover. Obviously, we’ve only done some very simple and goofy things so far. We wanted to start simple to get the hang of everything. [Jack] has let us know that the upcoming videos are going to be a little bit more serious and deal with some different aspects of pcb design. We can’t wait to see what he comes up with. [Pedro] had a busted laptop LCD screen on his hands, but rather than throw it out, he brainstormed what he could possibly do with what would typically be considered a worthless item. He decided to make a simple art installation using the scrapped part, so he gathered a few other supplies and got to work. The first thing he did was pull the LCD screen from the laptop, separating the front panel from the backlight panel. He drained the liquid crystal fluid from the display, and set it inside a picture frame in place of the glass. He added spacers around the edge of the frame so that the backlight could be mounted several inches behind the LCD panel. [Pedro] then found a few polystyrene and polycarbonate plastic items from around the house, and placed them inside the frame. As you can see in the picture above, the polarizing filter built into the LCD screen makes for some pretty cool effects. While you could debate for hours over exactly what is art, there’s no denying that his PolFrame looks cool and is a great way to save electronics from the scrap heap. We just want to know what he did with the LC fluid he drained from the screen! If you spent your weekend outside and away from the Internet, you might have missed the massive liquidation of HP TouchPads on Amazon, woot.com, WalMart, and the HP online store. Normally a $100 fully featured tablet is nothing to scoff at, but there is a catch: The HP TouchPad runs WebOS. 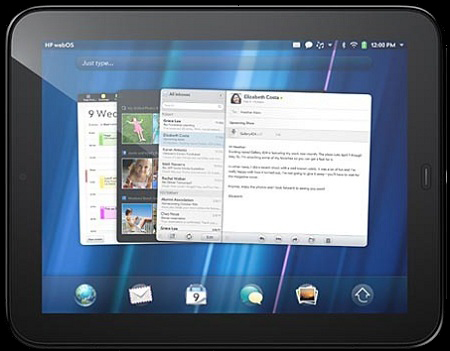 WebOS is a fine operating system for a tablet, but it’s not Android. The folks at HacknMod.com posted a bounty for the first person to port Android to the HP TouchPad. HacknMod is offering up $450 for a basic Android port and is looking for sponsors for the WiFi, Audio, Camera, and MultiTouch bounties. There’s a lot of discussion about the port on the XDA Developers and the RootsWiki forums if you’d like to get a bearing on how far along the project is. The TouchPad has already been rooted so there’s your starting point. We’d like to throw our hat into the ring, but we missed out on the TouchPad fire sale. If anyone knows of an online shop where they’re still available, leave a message in the comments. 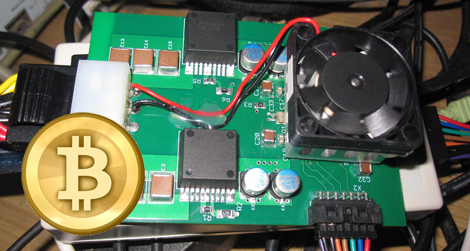 [fpgaminer], [li_gangyi], and [newMeat1] have been working together for the last few months to build an FPGA bitcoin miner that blows GPU mining rigs out of the water in terms of power efficiency. The board requires only 6.8 watts for 100 Mhashes/second, but [li_gangyi]’s blog says the team expects to hit 150-200 Mhashes with some improvements. That’s efficiency GPUs can’t touch. Bitcoins are a digital currency that are ‘mined’ by calculating hashes that verify bitcoin transactions. While mining operations can be performed on a CPU, graphics cards and FPGAs beat CPUs by several orders of magnitude in terms of how many hashes can be performed per second. The heart of the board is a Spartan-6 LX150 FPGA – a pricey bit of kit – and the team is selling each board for $440 USD. For that amount of money, you could buy two ATI 6770s at half the price and crunch four times as many hashes a second. At less than 7 watts, though, we wouldn’t worry too much about cooling the rig and the electricity costs will be very low.